When I started researching in-store experience many years ago, I set up a Google Alert for ‘experiential retailing‘ and ‘in-store experience’, those alerts have remained mostly silent until, well…this year really. Now, it ‘sounds-off’ like my Facebook notifications, ALL-DAY-LONG. But, while there might be more ‘Alerts’ now, little serve up insights and direction on how to effectively create more in-store experiences for customers. 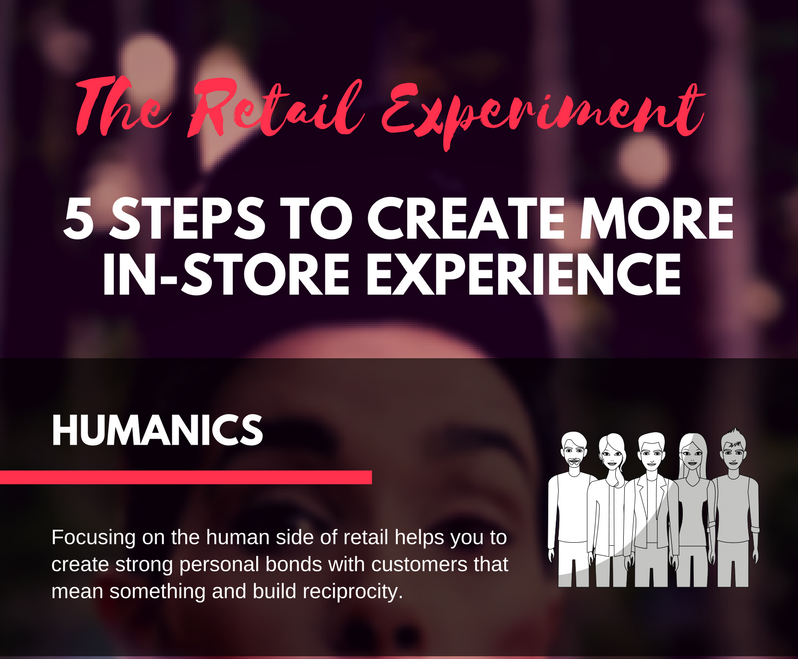 Something I’m hoping my new book The Retail Experiment and the infographic below for 5 Steps to Create More In-Store Experience will help shed some light on. As retailers, you might feel like your customers are listening to you less and less (despite spending more than ever on marketing). Well, that’s how I felt anyway. Not that long ago, I’d activate an advertising campaign and then brace for the wave of people and sales. We’d see a fairly big reaction in terms of increased visitation to the store and a spike in sales too. Who would have thought these curves and spikes would wane in such a short period of time? No doubt you’re wondering what has changed so dramatically since then? Well, I did too! So, for several years, I experimented in my own store to find out HOW and WHAT I could do to get my customers attention back – to re-engage them. I also wanted to start re-building trust and advocacy within my 2500sqm appliance store. Sure, I was interested in increasing our sales – what kind of retailer isn’t? However, I also genuinely wanted to help them too. More importantly, I wanted to show customers that I deserved to have their repeated business more than my competitors. So, after lots of research and testing different concepts, I discovered we needed more work on our in-store experience. Sure, we had a great team of professionals, but it just wasn’t a special or personal experience for our in-store customers. So, I set out to change that first in my store. Then, years later for others, as moved out of experimentation mode and into helping other retailers. Mindset – often the most challenging is shifting what being a retailer means to us – who are we and what is our purpose? Customer engagement is all about creating experiences that encourage your customers to interact with you. The creation of these experiences is not about extracting revenue, but rather to creating value for customers. When I say ‘waking up’, I mean, customers were opening our emails (our open rates tripled), responding to social posts and increasing their store visits. So, I’ve put those learnings, strategies and pitfalls into a book called The Retail Experiment, 5 proven strategies to engage & excite customers through in-store experience. For visual folks – like me, I created this “5 Steps to Create More In-Store Experience”, infographic. I hope you find the infographic helpful. If you’re interested in learning or reading more about The Retail Experiment – or you can download the first 3 chapters free. Wishing you ALL the experience your store and staff can handle! About the Author: Amy Roche is the author of, The Retail Experiment, Five proven strategies to engage & excite customers through in-store experience. (https://theretailexperiment.com.au) She’s a retailer, marketer and in-store experience engineer with a passion for helping other retailers re-connect with customers. Amy’s the founding director of Retail Rockstars – an event marketing platform that develops inspirational and educational LIVE in-store experiences and classes for large retailers’ customers. They source bespoke experts (Rockstars) to facilitate them, market and manage the events from start to finish. I’ve checked many retail websites to find out more about Retail Experience …in store, I haven’t found much. I will check back often – thanks! !